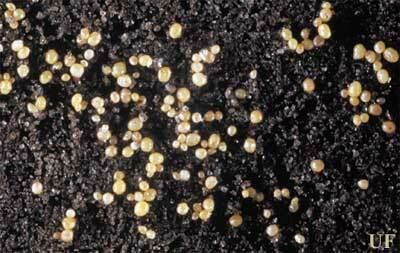 Ground pearls are small round scale insects on the roots of plants or in the soil. The pink adult stage crawls during early summer. The adult female ground pearl is a wingless, pinkish scale insect, about 1/16 inch long with well-developed forelegs and claws. The male is a gnat-like insect smaller than the female with a slender waxy "tail" up to 1/4 inch long. Clusters of pinkish-white eggs are laid in a white waxy sac. The slender nymph is covered with a hard, globular, yellowish-purple shell. Encysted nymphs (ground pearls) are up to 1/16 inch in diameter. Ground pearls can be serious pests in both southeastern and southwestern states. The roots of Bermuda-St. Augustine-, zoysia-, and centipede grasses are the most common targets. Ground pearl nymphs extract juices from underground plant parts. Damage includes circular dead areas that resemble fairy ring and is most apparent during dry spells as irregular patches of grass turn yellow. The grass in these spots eventually turns brown and usually dies by fall. The spots enlarge each year and mostly weeds grow in the infested areas. Overwintering takes place in the nymph or pearl stage. Females usually mature in late spring and emerge from their cysts. After a brief period of mobility, females tunnel 2 to 3 inches into soil and secrete a waxy coat. Within this protective covering, females develop eggs (without mating) and deposit them throughout early summer. Approximately 100 eggs are laid by each female. The slender nymphs emerge in mid-summer and infest grass rootlets. Once they initiate feeding, nymphs soon develop the familiar globular appearance. There is usually one generation each year. However, if conditions are not favorable for emergence, female nymphs may remain in the pearl stage for several years. Roots of new turf should be checked at planting to avoid infested grass. Watering and fertilizing as prescribed by a proper soil test, proper mowing height with a sharp bladed mowers and other good cultural practice will help lawns recover from ground pearl injury. No insecticide is specifically labeled for ground pearl control but Garrett Juice with 2 oz of orange added per gallon will work well to control the pest. Applying 1/2 quality compost is also effective. While university testing proceeds, maintaining healthy, vigorous lawns through organic techniques is the best long term control.